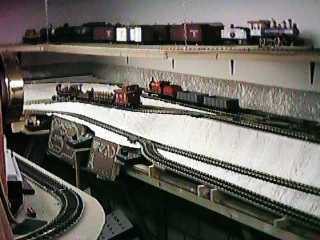 The layout is controlled from four control stations, two of which are shown in this picture. The third panel controls the main yard and the fourth panel controls the trolley. The panels are hinged at the bottom so that they can fold out for wiring and maintenance. While turnout control can still only be done from a panel, both the inner and the outer lines are operated with Aristo Train Engineer radio control throttles which provides excellent control and freedom of operator movement, until a turnout needs to be thrown anyway. There are three Interlocking Route Control Systems, one in each of the main, upper and yard panels to aid in the setting of turnouts.